ND software studio dia which is home stadium of "Montedio Yamagata." Hot water of the source, hot water (feel and straw) of 4.6, tortoise bath (hot water of Okama). Well-established inn in business for about 300 years. Refurbish, and open, inn in gallery. We can overlook Shirataka-machi from extensive large communal bath. It is pakugoru more. Tear off real hot spring of Nagai-shi; *yu is 100% of sources! Abundant quantity of water. Pet in Yonezawa skiing area is big dog, cat cha from accommodation small size dog which can stay, too. Onogawa Onsen "shishidoya inn Jurakuso"
Anyway, large communal bath, the source gravity-feed irrigation of about 1,000 L is fresh an hour. Goshiki Onsen "sect river inn"
In open-air bath in sea of trees known as Kodakara-no-Yu Hot Springs, the north foot of Mt. Azuma-san system. gensekikuchihakufuonsenchuokubetsukanfudokakuitojokawa of 100 famous mountains in Japan Mt. Azuma-san. Quantity of water is abundant in beautiful bath, too. Please give one mat which wants to warm. 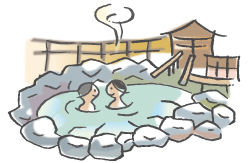 Shirabu Hot Springs "arbor inn"
Wave is abusive for 700 years, the origin of hot spring culture. We let you beat, and bath provides unchangeable accommodation. The Yonezawa-shi forest experience-based interchange center "hall of Shirabu Mori"
We accept group, long-term consultation. Shirabu Hot Springs "accommodation west shop of hot water waterfall"
Accommodation which conveys healing of hot spring where old kara leads to in now. Main building of thatch roof is mark open. Free breakfast service. All rooms LAN, terrestrial digital, BS, Wi-Fi radio L..
We offer hospitality with seasonal (wild plants dishes) dishes.